SASKATOON – A team of researchers from the University of Saskatchewan (U of S) has developed two caffeine-based chemical compounds that show promise in preventing the effects of Parkinson’s disease. The team focused on a protein called α-synuclein (AS), which is involved in dopamine regulation. “Our results show promise in preventing the progression of Parkinson’s disease,” said Jeremy Lee, a biochemist from the U of S College of Medicine. 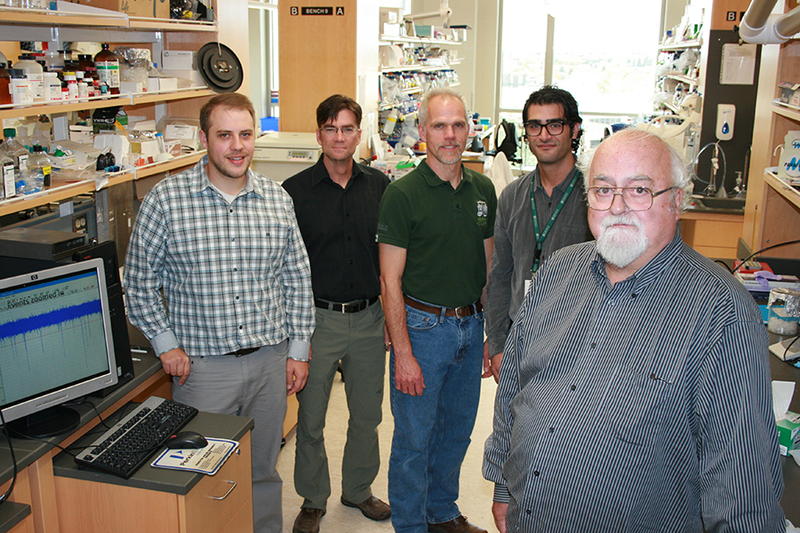 Lee, a biochemist from the U of S College of Medicine, and Ed Krol, from the College of Pharmacy and Nutrition, led the team, which included researchers Troy Harkness and Joe Kakish from the College of Medicine, as well as Kevin Allen from the Drug Discovery and Research Group in the College of Pharmacy and Nutrition. Parkinson’s disease attacks the nervous system, causing uncontrolled shakes, muscle stiffness and slow, imprecise movement, chiefly in middle-aged and elderly people. It is caused by the loss of brain cells (neurons) that produce dopamine, an essential neurotransmitter that allows neurons to “talk” to each other. In Parkinson’s sufferers, AS gets misfolded into a compact structure associated with the death of dopamine-producing neurons. Worse, AS appears to act like a prion disease (for example, variant Creutzfeldt-Jacob or “mad cow”). In prion diseases, one mis-folded protein triggers mis-folding in others, spreading like falling dominos. Although the chemistry was challenging, Lee explained the team synthesized 30 different “bifunctional dimer” drugs, that is, molecules that link two different substances known to have an effect on dopamine-producing cells. They started with a caffeine “scaffold,” guided by literature that shows the stimulant has a protective effect against Parkinson’s. From this base, they added other compounds with known effects: nicotine, the diabetes drug metformin and aminoindan, a research chemical similar to the Parkinson’s drug rasagiline. Using a yeast model of Parkinson’s disease, Lee and his team discovered two of the compounds prevented the AS protein from clumping, effectively allowing the cells to grow normally. The team’s findings are published in the journal ACS Chemical Neuroscience. Funding for the research was provided through the Saskatchewan Health Research Foundation and the Natural Sciences and Engineering Research Council of Canada. The U of S Industry Liaison Office provided initial funding through its Proof of Concept Fund and has prepared a summary of the technology, inviting potential charitable funding and commercial partnerships to help develop it further.